Try the new Cathay business seat and win a luxury holiday to Hong Kong! 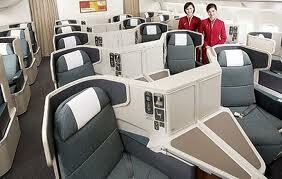 Today (Wednesday) and Thursday, Cathay Pacific is showing off its new 2-metre flat bed business class seat in London. They have erected a little tent on the roof of One New Change, the new monster shopping centre opposite St Paul’s Cathedral on Cheapside. You can pop along between 11.30am and 5pm both days, try out the seat and grab a free soft drink. I was down there yesterday. The winner must book before 31st December, to travel before 30th September 2013. Would anyone like to meet there this afternoon for a glass of something soft? 15:00-ish? There is also a bar on the roof of New Change, albeit not a free one! And astonishing views of St Pauls and South Bank.